ATTENTION: As of January 1st, 2016, the Cisco Telepresence system in Atkinson Hall is no longer avaialble. Cisco TelePresence is a proprietary virtual meeting solution, where participants feel like they are sitting in the same room, though they may be thousands of miles apart. Companies and individuals who have access to one of the many Cisco TelePresence rooms installed worldwide or are located near a Cisco TelePresence Public Suite, will be able to meet face to face with memebers of our academic community. 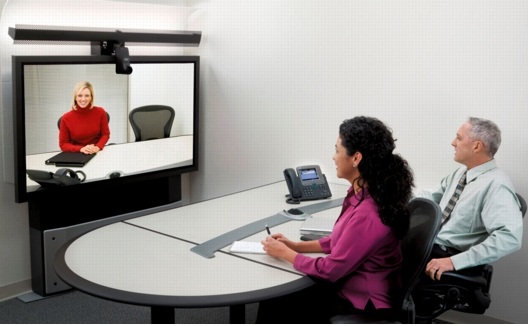 TelePresence is different from the commonly used H.323 videoconference technology. Please confirm that the remote site has access to a commpatible system. Calit2 hosts the only Cisco TelePresence system on the entire UC San Diego campus. Our Cisco TP conference room is equipped with a CTS-1000 system, and it's located in Atkinson Hall room 5123. The UC San Diego Cisco TP system operates on the academic research network know as the National Lambda Rail (NLR). Our system will connect seamlessly with other units on the same network. Access to UC San Diego's Cisco TP room and system is scheduled through the Calit2's Reservations System. - For connecting to institutions served by the NLR network, you just need to know the telephone number of their system. Once inside the room, use the system's phone to dial your party's number. Who Can I Connect To? Calls can only be made to locations that have the same Cisco TelePresence technology. Many large private companies have TelePresence rooms at their locations that can be used to connect to the UC San Diego system. For a list of all the research institutions on the NLR network, please click here.